Lot 54 Early 1930's S.R. 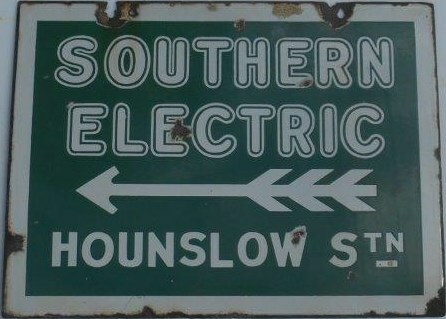 Unflanged Double Sided Street Direction Enamel Sign "SOUTHERN ELECTRIC - HOUNSLOW STN" - with left hand facing arrow. Size 20" x 15". Good condition.